Murray A. Rae. Architecture and Theology: The Art of Place. Waco, TX: Baylor, 2017. 305 pp. Hardback, $49.95. ISBN 978-1481307635. Murray Rae’s most recent book, Architecture and Theology: The Art of Place, is a storehouse of insight. Though the book’s title may seem to suggest an exclusive audience, thoughtful readers from all disciplines would find this work worth their time. For those with artistic sensibilities, Rae’s work is an absolute delight. For others, for whom art and architecture are simply curiosities, his work is a warm invitation to look more closely at the world we inhabit as well as a guide for discovering wonders in the woodwork and “angels in the architecture.” Architecture and theology illuminate one another. While neither necessarily adds something to the other that it did not previously possess, both have the capacity to shed light on realities inherent in the other. Rae does a marvelous job of drawing from multiple disciplines in crafting his work, including theology, the arts (spatial and otherwise), philosophy, history, anthropology, and sociology. Indeed, his work is to be applauded as one that paves the way for interdisciplinary study and dialogue that serves to enrich all those involved. Architecture and Theology is also filled with various figures and examples of structures throughout the world—in Rome, Paris, Japan, the United States, Barcelona, even Rae’s home country of New Zealand—that poignantly illustrate each chapter’s unique material. The inclusion of forty-seven select images aids readers in further grasping the thrusts of his arguments, and, I believe further piques readers’ curiosities by providing firsthand glimpses of the concepts under discussion. Rae introduces his work as one that need not be read in succession or in its entirety (5). Although he is correct, I wonder if he discourages readers from engaging his work as a whole. I found that each subsequent chapter built meaningfully upon the former, rendering Rae’s overall presentation increasingly more rich and significant. Though the chapters are substantial enough to stand alone, together they form a convincing, cohesive whole, and I think benefit one another when read in succession. To the skeptic, reading through each of Rae’s chapters will, I trust, soften skepticism into an appreciation of his task. Rae’s presentation is robust and well supported. Those not as interested in art and architecture will at least have recognized the rightful place these have at the table with theology in particular, among other disciplines. Structured in nine chapters, the first chapter of Rae’s book serves an introductory function, orienting readers to the general discussion and briefly noting some of what the following chapters will address. Rae notes that the goal of his book is “to enrich theological conversation through conversation with the arts,” referencing the present cultural milieu, the past and present influence of philosophy and science, and the nature of theology itself as “reasons why such a project may yield new insight and understanding” (8–9). His second chapter, "A Place to Dwell: Construing the World through the Construction of Place,” considers the meaning of humanity’s demarcating and inhabiting of spaces and places. He suggests that architecture is key for how we as human beings make sense of the world, while it also gives expression to our understanding of what it means to be human. Additionally, Rae considers biblical examples of placement and displacement, beginning with the Garden of Eden, highlighting Abraham and David, and culminating with Jesus Christ incarnate. 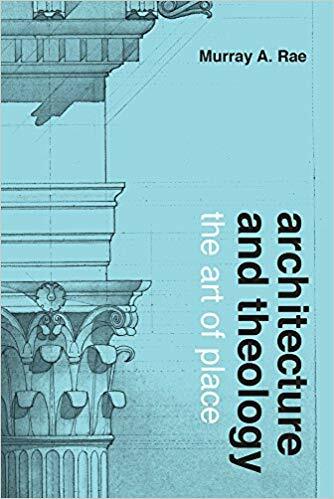 Tying architecture to theology, of Scripture’s witness he notes, “[T]he course of the biblical story suggests that humanity’s engagement with space and place deserves careful theological attention” (35). Chapter three, titled “Freedom and Rule: Conceiving the Law as a Realm of Freedom and Creativity,” gives voice to the benefits—and collaboration—of both regulation and freedom. Rae uses architectural rules to illustrate the necessity of law, but also focuses on the juxtaposition of freedom to rule in order to paint a picture of the creativity and innovation possible within proper bounds. The Parthenon is one example of an architectural feat made possible only by the cooperation of rule and creativity. Relating this concept to theology, Rae discusses the notion of freedom from the Christian’s point of view, recognizing the place of the law in relation to true freedom. Contrary to the notion of freedom in modernity, in which freedom is construed as being unencumbered by any constraints or external order, Rae claims that rule enables freedom. Indeed, architecturally and in all of life, boundaries facilitate creativity. Rae’s fourth and fifth chapters both conceive of architecture as capable of restorative and anticipatory functions. Chapter four, “Making All Things New” is well summarized by its subtitle: “Transforming the World through Adaptation and Renewal.” Here Rae highlights examples from ancient Rome, such as the Christian use of the basilica foreshadowing the eschatological reality of God’s throne being located on earth (82), the shrewd and restorative use of spolia, and the conversion of pagan buildings into use for Christian purposes (cf. 81–97). Chapter five, “A Foretaste of Heaven,” carries on the theme discussed in the prior chapter, suggesting that our built environment here in the Civitas Terrena can serve to anticipate the New Jerusalem. Additionally, through his discussion of public space and welfare, Rae points to the power of architecture to communicate both present theological realities and those in the future we await with hope. Through multiple examples it becomes clear that how cities plan, form, and utilize communal space can draw the city into corporate worship, validate the goodness of work, and even communicate value to the orphan, widow, and outcast. “Above all,” Rae suggests, addressing the theological value in urban representation of the Christian narrative, “it presents Christian discipleship as a form of life to be lived in the public realm” (125). That is, our architecture, when planned and built accordingly, can remind us that the life of faith is not merely an individual matter. Christ calls us to koinonia, and architecture can help facilitate the life of Christian community. Rae distinctly incorporates philosophy into his theological engagement of architecture in chapters six through eight. Chapter six, “Knowing and Dwelling: Considering Epistemology through Habitation and Homelessness,” engages architecture and place as instrumental in our knowing. Recognizing the emphasis that modernity and academia have placed on detachment in relation to knowledge, Rae proposes that the places we inhabit and indwell contribute meaningfully to our conceptions of reality. This includes how we know and experience God. Rae affirms that knowing often requires us to dwell with—even within—that which (or whom) we seek to understand (177). Citing primarily John’s Gospel, he points to where this theme surfaces in the biblical narrative. “Presence and Absence,” Rae’s seventh chapter, discusses how architecture aids us in “discerning the transcendent in the realm of the immanent” (181). Contra both futurist and realized eschatology, he suggests that we inhabit an inaugurated eschatology. Our world is a liminal space in which the kingdom of God has broken in, and yet is not fully come. We live after the Incarnation, but await Christ’s parousia. In order to engage this reality responsibly and meaningfully, Rae offers the arts as an avenue for doing so. He claims the arts are “adept at negotiating the dialectic between presence and absence” (187), and provides examples of existing structures that mediate: drawing the inhabitant toward the transcendent while locating her firmly in the immanent. Returning to the theme of time introduced in chapter seven, Rae engages it more fully in chapter eight, “Places Full of Time: Marking Time through the Medium of Place.” Contra the modernist approach to time and history, which Rae condenses and represents in the perspective of Gotthold Lessing, he recommends a different conception of time. Rather than viewing it as something beyond our reach, ever darting out of existence, he proposes that time is "the capacious realm of divine grace in which nothing is lost, and in which all things are brought to their true end as objects of God’s creative and loving purpose” (222). He ties this concept to architecture, which “takes place in time” (235). Architecture, then, is provided as evidence of how time past is available in the present, and further provides hope in looking toward the future. Chapter nine takes a look at how architecture can play a role in our healing in the wake of human atrocities. The chapter’s title is telling: “Building from the Rubble: Reaching for Redemption through Memory and Hope.” Using 9/11 and the Holocaust as his primary examples, Rae considers generative—as well as adverse—architectural responses proposed and erected after these life-altering events. Though some were insensitive and domineering, others were incredibly thoughtful, sensitive, and appropriately complex. While Rae is aware of and clear about the fact that architecture “cannot heal our brokenness,” he suggests that what we build can indeed “reveal the extent to which the Spirit is at work within us, nudging us toward forgiveness and reconciliation and a true mending of the world” (256). On a critical note, sections containing technical architectural jargon may prove a stumbling block to some. Though familiar with art, my reading progress was slowed a bit in such circumstances, and though I believe I got the gist of the arguments, a brief explanation of technical concepts would have been helpful. Additionally, as numerous and diverse as the architectural examples provided were, the vast majority came from Western, European (or European influenced) cultures. It would have been beneficial to include a greater diversity of architectural examples, e.g., more from the global East and South. Overall, I recommend this book to anyone for whom the title sparks interest, and frankly, all the more heartily to those for whom it does not—precisely for that reason. By opening up an expansive vista, Rae accomplishes what some of his architectural illustrations do. His book awakens; it provides (in)sight, understanding, and even hope by teaching one to see in the spatial arts immediately around us—and around the world—richer textures and manifestations of the things of God. May all who set out to journey through theology by way of stepping into a cathedral or city square be blessed by having such a guide as Murray Rae aid them in opening their eyes to behold that which has been there all along.